Case in point: wrapping presents. I just cannot master this task. In fact, I literally text pictures and call everyone when I manage to wrap a gift with no wrinkles, tears or bulges in the paper. Because I figured a lot of ladies are just like me - "wrapping challenged"- I've asked twin sis to get star in my post today to show my readers how to wrap a gift properly. Side note: twin sis runs a seasonal business of wrapping gifts for clients in the SA-area. Reach out to me if you hate wrapping gifts and would rather have someone else handle all that biz! Turn the box upside down and lay it out on wrapping paper. 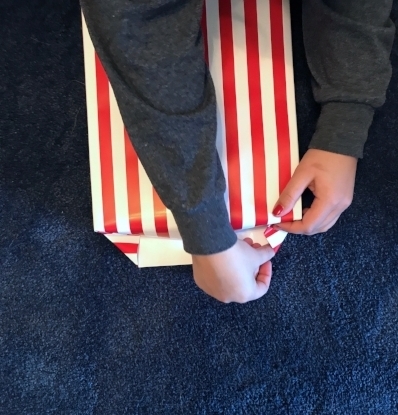 Determine how much paper you will need by taking the wrapping paper and folding it from both sides over the box until the sides meet in the middle, slightly overlapping. Then, cut the paper to remove the the necessary amount from the roll. Situate the box in the middle and fold both sides of the paper lengthwise over the box and tape. On one of the shorter sides of the box, pinch in the side to form a triangle in the corners, and press in to crease. The top and bottom flaps should now look like isosceles triangles. Fold the top flap down and tape to the box. With the bottom flap, fold the top portion over just slightly and crease. Then, tape the bottom flap to the box, over the taped upper piece. Repeat steps on other side of box. Decorate with a pretty ribbon or bow and gift!